Sunflowers are characterized by their large, daisy-like flowers, which are most commonly yellow with brown centers. Even miniature varieties of sunflowers are tall, growing between 2 and 4 feet in height, but giant versions grow up to 20 feet. Sunflowers cast their own shade and stand above many other plants. Choose plants that grow well with sunflowers to create a healthy garden environment. Sunflowers help attract desirable insects to the garden. Many insects are attracted to the tall, bright flowers. Asters and zinnia flowers also bring "good" insects to the garden, and the three flowers work well together in outdoor environments. All three flowers are brightly colored and together they are visually appealing in garden beds, as well. When planted with bush beans, the tendency sunflowers have of casting shade on garden areas becomes an asset. Bush beans grow best in partial shade, so place them close to sunflowers to take advantage of this asset. Sunflowers also attract bees and other insects to the beans, which aids in pollination. Sunflowers also make good companion plants for artichokes. When added to a vegetable garden bed, tall sunflowers add bright color and aesthetic appeal to the area. Sunflowers, which are grown as annuals, must be re-planted every year. 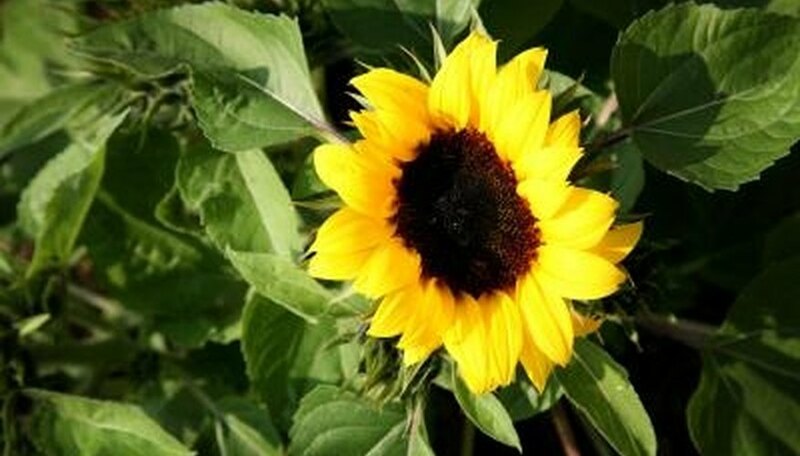 Plant sunflower seeds at the same time as cucumber and corn plants; all three require similar weather and soil warmth. Sunflower makes a good companion for corn and cucumber plants. Corn grows very tall, so it doesn't have to compete with sunflower plants for sunlight. Sunflowers have some allelopathic characteristics, which means it releases a toxin that is not dangerous to humans but may be damaging to other plants. Sunflowers grow well with a few vegetables but will have negative effects on others. Unlike bush beans, pole beans will not grow well when planted near sunflowers. Irish potatoes are also poor companions for sunflowers. It is possible to grow sunflowers in the same garden as Irish potatoes and pole beans, but they should be spaced far apart so the flowers will not affect the vegetables.